There is an entry up on the Scientific American Blog Network’s Guest Blog by two of the principals of μBiome. In Crowdfunding and IRBs: The Case of uBiome Jessica Richman and Zachary Apte address prior criticism of their approach to the treatment of human subjects. In particular, the criticism over their failure to obtain approval from an Institutional Review Board (IRB) prior to enrolling subjects in their study. In February, there were several posts about the ethics of this choice from a variety of bloggers. (See links from Boundary Layer Physiology (here, here, here) Comradde Physioprof (here, here, here), Drugmonkey (here), Janet Stemwedel (here), Peter Lipson (here).) We greatly appreciate the comments, suggestions and criticisms that were made. Some of the posts threw us off quite a bit as they seemed to be personal attacks rather than reasoned criticisms of our approach. If you follow the linked blog posts, you will find that when Richman and/or Apte engaged with the arguments, they took a wounded tone. This is a stance they continue. We thought it was a bit… much, shall we say, to compare us to the Nazis (yes, that happened, read the posts) or to the Tuskegee Experiment because we funded our project without first paying thousands of dollars for IRB approval for a project that had not (and might never have) happened. I was one of the ones who brought up the Tuskegee Syphilis Experiment. Naturally, this was by way of making an illustrative example of why we have modern oversight of research experiments. I did not anticipate that any of the research planned by the uBiome folks would border on this sort of horrible mistreatment of research subjects. Not at all. And mentioning that older history does not so accuse them either. PhysioProf made this point very well. This is a critical reason why scientists using human or animal subjects need to adhere to the oversight/protection mechanisms. The second critical reason is that the people doing the research are biased. Again, it is not the case that one thinks all scientists are setting out to do horrible Mengele type stuff in pursuit of their obsessions. No. It is that we all are subject to subtle influences on our thinking. And we, as humans, have a very well documented propensity to see things our own way, so to speak. Even when we think we are being totally objective and/or professional. By the very nature of this, we are unable to see for ourselves where we are going astray. Thus, external oversight and review provides a needed check on our own inevitable bias. We can all grumble about our battles with IRBs (and Institutional Animal Care and Use Committees for animal subject research). The process is far from perfect so a little bit of criticism is to be expected. Nevertheless I argue that we should all embrace the oversight process unreservedly and enthusiastically. We should be proud, in fact, that we conduct our research under such professional rules. And we should not operate grudgingly, ever seeking to evade or bypass the IRB/IACUC process. Before we started our crowdfunding campaign, we consulted with our advisors at QB3, the startup incubator at UCSF, and the lawyers they provided us. We were informed (correctly) that IRBs are only required for federally funded projects, clinical trials, and those who seek publication in peer-reviewed journals. That’s right — projects that don’t want federal money, FDA approval, or to publish in traditional journals require no ethical review at all as far as we know. Well, that is just plain wrong. Being a professional scientist is what “requires” us to seek oversight of our experiments. I believe I’ve used the example in the past of someone like me buying a few operant chambers out of University Surplus, setting them up in my garage and buying some rats from the local pet store. I could do this. I could do this without violating any laws. I could dose them* with all sorts of legally-obtainable substances, very likely. Sure, no legitimate journal would take my manuscript but heck, aren’t we in an era where the open access wackaloons are advocating self-publishing everything on blogs? I could do that. Or, more perniciously, this could be my little pilot study incubator. Once I figured I was on to something, then I could put the protocols through my local IACUC and do the “real” study and nobody would be the wiser. Nobody except me, that is. And this is why such a thing is never going to happen. Because I know it is a violation of my professional obligations as I see them. Although we are incubated in the UCSF QB3 Garage, we were told that we could not use UCSF’s IRB process and that we would have to pay thousands of dollars for an external IRB. We didn’t think it made sense (and in fact, we had no money) to pay thousands of dollars on the off chance that our crowdfunding campaign was a success. We are happy to say that we have completed IRB review and that our protocol has been approved. The process was extremely time-consuming, and expensive. We went back and forth for months to finally receive approval, exchanging literally hundreds of pages of documents. We spent hundreds of hours on the project. First, whatever the UCSF QB3 Garage is, it was screwing up if it never considered such issues. Second, crying poverty is no excuse. None whatsoever. Do we really have to examine how many evils could be covered under “we couldn’t afford it”? Admittedly, this is a problem for this whole idea of crowd-funded science but..so what? Solve it. Just like they** had to solve the mechanisms for soliciting the donations in the first place. Third….yeah. Doing things ethically does require some effort. Just like conducting experiments and raising the funds to support them requires effort. Stop with the whining already! The authors then go on in a slightly defensive tone about the fact they had to resort to a commercial IRB. I understand this and have heard the criticisms of such Pay-for-IRB-oversight entities. From my perspective this is much, much lesser of a concern. The absolute key is to obtain some oversight that is independent of the research team. That is first-principles stuff to my view. They also attempt to launch a discussion of whether novel approaches to IRB oversight and approvals need to be created to deal with citizen-science and crowd-funded projects. I congratulate them on this and totally agree that it needs to be discussed amongst that community. What I do not appreciate is their excuse making. Admitting their error and seeking to generate new structures which satisfy the goal of independent oversight for citizen-science in the future is great. But all the prior whinging and excuse making, combined with the hairsplitting over legal requirements, severely undercuts progress. That aspect of their argument is telling their community that the traditional institutional approaches do not apply to them. UPDATE: Read uBiome is determined to be a cautionary tale for citizen science over at thebrokenspoke blog. *orally. not sure civilians can get a legal syringe needle anywhere. Animals in Research: Mice and Rats and Pigeons…Oh My! During what fraction of the time you spent at each major career stage in academics – undergrad, grad school, postdoc, faculty level (TT or no, plz specify) – did you feel comfortable? Not did you feel it was easy exactly, but did you feel as though you had it handled? As though there was little doubt you were doing a good job of what you were expected to do. For me, undergrad all 4 yrs, grad school 3 yrs, postdoc maybe a scattered 2 yrs total time. At the faculty level maybe my first three years and again for maybe 6 mo last year. For faculty, make special note of the tenure decision- were you feeling comfortable in the few years leading up to that? You no doubt remember the advice of Scott Kern and that of Mu-ming Poo with respect to what it takes to survive and thrive in an academic career. One Radhika Nagpal has written a counter argument from her current position as Full Professor at Harvard. right now. I can wait. The paradox of the poles of the work-life balance discussion in Nature News is this. Nobody who succeeds at work and then claims balance really knows if they just got very, very lucky in their career. Nobody who works around the clock and drives their lab to similar performance knows that this was *required*. The hidden side is that both balanced and St Kern/Poo’d types also fail in their careers. UPDATE 09/06/11: Plus also, StKern/Poo’d types can also succeed in their careers really, really well….and still fail to cure cancer. Yes, I for damn sure wish for more hours in the day. Yes. Of course. And at each and every major stage there were things being neglected so that I could pursue some other thing. Either in the proximal, days to weeks, or in the long-haul, years to decades(! ), perspective. But I have never been an obsessive and any fair read would fail to find any major imbalance. I think the most useful and general approach is that you have to be willing to fail. Let me say it again: YOU HAVE TO BE WILLING TO FAIL!!!!! There were several areas in which I picked up either positive (“gee, that seems useful”) or negative (“not gonna go there”) PI patterns from this person. One of the former was this guy’s role as father and scientist. Whenever one had to find this PI, if he wasn’t around because of father duties his whole lab knew about it. “Oh, he’s at Opening Day.” or “He had a sick kid today, he’ll be back later”. or “He’s taking his kid to [SportingActivityX]”. This guy has a perfectly viable career with nice pubs, great NIH grant support, always seems to have at least 4-5 postdocs and a similar number of techs, serves study sections, organizes symposia, etc. In short, he’s well respected and does not appear to have paid any obvious sort of career price to date. This had a great impact on YHN as I was transitioning both as PI and father. The power of this example for me was basically “Screw it, if he doesn’t worry about being known at work as a guy who takes his role as father seriously then I’m not going to worry about it either”. The interesting thing, which is emerging on the Twitters, is that Professor Nagpal’s advice is really no different from a host of women who write “You can’t have it all” screeds and lament the fact “You have to be twice as good as a man to succeed”. The ones that describe not being their enough for their kids or the ones describing being their too much and failing. The men too, although their career advice is thinner. See Kern and Poo links at the top–they describe how “it has to be” because this is how it was for them. And you know what? It is ALL true. All of it. Because these are personal anecdotes tied to the career history and success of the person giving the advice or reciting their life-story in academics (or other professional life). My advice, scattered throughout this blog, is no different. And just as the winners of global social politics write the histories of what happened and for what reason, likewise those who have succeeded in academic science tend to write the prescriptions for our careers. I don’t think Professor Nagpal has written some amazing revelation here. It is not hugely different than arguments that I make myself on this very blog. It is true that she has been very, very successful by appearance. But there are also, I would wager, tons of people who made the choices she made and were denied tenure. Many who washed out of academic professordom entirely. And that is the point about this advice which runs from Nagpal’s 50 hrs max to the Kern/Poo maxim of “always more”. 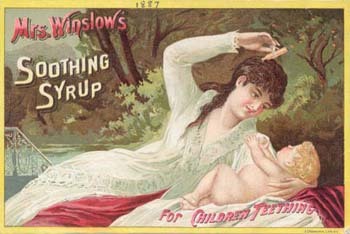 Repost: Musty Must-Read: "Mrs. Winslow's Soothing Syrup"
I originally posted this Jan 09, 2008 on the old blog and reposted it 12/12/2008 with small improvements over the prior version. It has been one of my more popular posts when it comes to Google hits. You might want to check out a personal recipe for opiate based cough remedy as well. We have monthly workshops for new faculty sponsored by the dean’s office and were recently told that “NIH funding rates are at 10-15% but we expect all of our faculty to be in the top 10-15%.” Large state school R1. Deans who expect all of their faculty to be in the top 15% of all scientists funded by, for example, the NIH are delusional. That’s the first problem. Especially if you are in a large state school with a heavy research mission. There have to be at least 50 of these, by anyone’s criteria for “large state school R1”, in the US. The Rock Talking blog indicated there are something on the order of 85,000 applicant PIs to the NIH. Gating on R01 apps only, there are about 1,200 applicant institutions (1,900 counting all application types). Fifteen percent of 85,000 is 12,750 investigators. If these are evenly distributed between 1,200 or 1,900 institutions, we end up with 8-11 top-15%ile investigators at each institution. Now, we don’t know the size of the skew in the distribution and my estimate of 50 large state schools is rough. It also overlooks the big private universities and medical schools as well as a couple of moneybag$$ research institutes. Luckily, there is the NIH RePORT. Ranking applicant institutions by aggregate funding in FY2013 I’m down to 200 places and still seeing Universities that might be seen as “large state schools, R1”. Especially by their own Deans of Research and/or Faculty. The Universities around a rank of 200 are landing about $8 million, each, from the NIH so far this Fiscal Year. Let’s suppose that the above 12,750 top-15%ile investigators were distributed only to these 200 applicant institutions- we end up with only 63 investigators per institution. From this analysis, the Dean would have to be overseeing only 63 faculty to make the expectation a valid one. Soo…that leads to another question, how many awards per institution as we descend the ranks? Well ranking the FY2013 table by the number of awards, I make it to about 115 applicant institutions with more than 63 awards. Obviously, some subset of investigators are holding multiple awards so this is a very rough indicator. But still. The idea that only about 60 or so professors are seeking NIH funding from these rather large state Universities that slot in around the 116 total-NIH-funding rank is absurd. Clearly there are many, many more. The abovementioned expectation was also, I remind you, directed at the first 6 years of a professor’s career since this is when the tenure decision comes. These poor suckers have a very narrow window to get their NIH grants funded. That’s a further absurdity in the expectation. Finally, to undercut both my analysis and the expectation that triggered this post…. NIH grant success rates are per-application and do not reflect the per-PI success rate. We have not yet see, to my recollection, is a per-applicant success rate across a 2-3 year interval. It is likely higher than the NIH’s per-application success rate but I really don’t know that for sure. If it is substantially higher then succeeding in time where the NIH success rate is 15% is going to be available to more than 15% of all applicant PIs. OTOH, the RockTalk analyses (here, here, here) argue that the massive increase in applications is being driven by more applicants, not by the same number of applicants submitting more grants. So it may be that the per-PI success rate really doesn’t differ much from the per-application success rate. Monteith Dead at 31. Drugs, one presumes? Apparently this Cory Monteith was kind of a big deal, star of a hit television show and what not. Also a drug addict. His latest stint in rehab, by reports, was this April. Vancouver Chief Coroner Lisa Lapointe said the actor had been dead for several hours when his body was discovered. “Mr. Monteith was found deceased in his room at approximately noon today,” Lapointe said at a news conference late Saturday. Acting Vancouver Police Chief Doug LePard said the evidence shows Monteith was last seen returning to his room alone late Friday night. Although the cause of death is not yet known, police have ruled out foul play. Police said they believe he was alone when he died. In 2008 we discussed the death of Heath Ledger and upon wondering if he was a drug addict it emerged that we weren’t supposed to discuss his addiction. I have to admit my first thought on hearing this news was…weariness. I wasn’t going to blog it. Luckily, I don’t have to, see the end of the post. I am, however, very interested to see how much our popular consciousness has changed. Particularly since this poor guy had been open about his struggles with drug use. Is it now okay to start right in with the discussion of how his addiction to drugs led to this? Or at least to speculate? Maybe we will be okay discussing his possible affective disturbances (depression? anxiety? other?) that led to his substance use? Can we discuss this without stigma just like we might discuss Tony Soprano’s bad ticker and Angelina Jolie’s breast cancer risk factors? In the mean while, there is a fantastic post up at the unlikely activist blog. It talks a little bit about why those of us scientists who are interested in topics of substance use and abuse do what we do. Over the forthcoming days, the facts and events that led to Mr. Monteith’s death will be splashed over the pages of every newspaper in the land. His story, however, is played out every day in small communities around this country. He is only one example of a victim of a disease that knows no bounds. The anonymous die every single day in this country because of their disease, and their plight must not be ignored. Wealth cannot protect someone from an addiction. Neither can talent or beauty. Neither can fame. And in many cases, even the love of family, friends and a partner cannot stop it. And in many cases, even the best treatments we have cannot stop it. The hope for people suffering from this disease is scientific research into the mechanisms, causes and targets of treatment for addiction. It’s why we must put as many resources as we can onto research that aims to stop the needless suffering and deaths of the famous and anonymous alike. We must combine the use of sophisticated brain imaging methods and genetic analyses in human subjects, with molecular and cellular studies in animals. It’s why we must give the victims of this illness the compassion and help they need, just like we do so for people with other preventable illnesses like cancer, HIV/AIDS and diabetes. UPDATE 07/16/13: The Coroner confirms Monteith’s death due to heroin and alcohol.